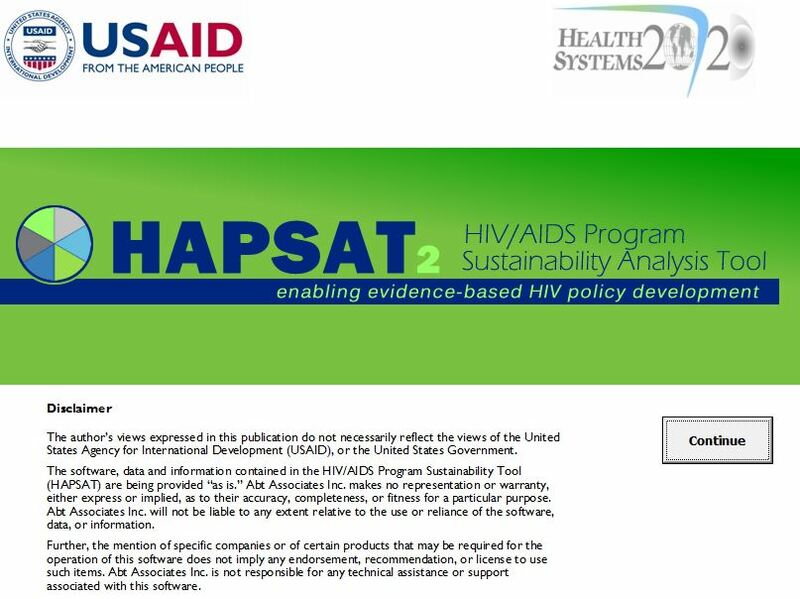 The HIV/AIDS Program Sustainability Analysis Tool (HAPSAT) was developed by the USAID funded Health Systems 20/20 Project to assist governments and donors with the development of HIV/AIDS policies and implementation plans. HAPSAT utilizes a computer-based model for forecasting and analyzing the sustainability of HIV/AIDS programs during periods of service delivery scale-up and/or when facing limited or unknown future resource levels. The updated HAPSAT 2.0 enables policymakers to synthesize data from many sources in a coherent and comprehensive policy model. The tool enables country-led consideration of evidenced-based policy options in a convenient framework. It is designed to be adapted to country context and models user-specified policy scenarios. Read the software brief to learn how your country can use HAPSAT 2.0. Practice using the tool with the HAPSAT 2.0 Software: Hands-on Exercise.